At the end of the 2018 Illinois Entrepreneurship and Small Business Growth Association (IESBGA) Conference, held May 16-18 in Champaign, we were thrilled to be awarded the Roger Luman Program Excellence Award for our marketing and branding efforts. 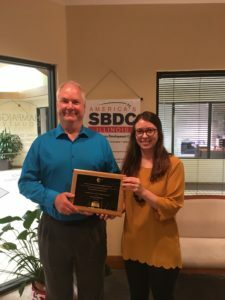 The award was created to recognize outstanding, innovative and best practices in the programs and services offered by SBDC centers. These awards recognize specific programs developed by centers to meet a particular identified need and not the overall program or services offered by a center. It is intended that this awards program will facilitate the sharing of information regarding these programs with other IESBGA members resulting in their replication, and will be used to promote the excellence of Illinois small business assistance programs to small businesses and to similar small business assistance programs administered in other states. Thank you to the Illinois Entrepreneurship and Small Business Growth Association for this honor.